The AEHF-1 satellite under construction prior to its 2010 launch (Credits: Lockheed Martin). 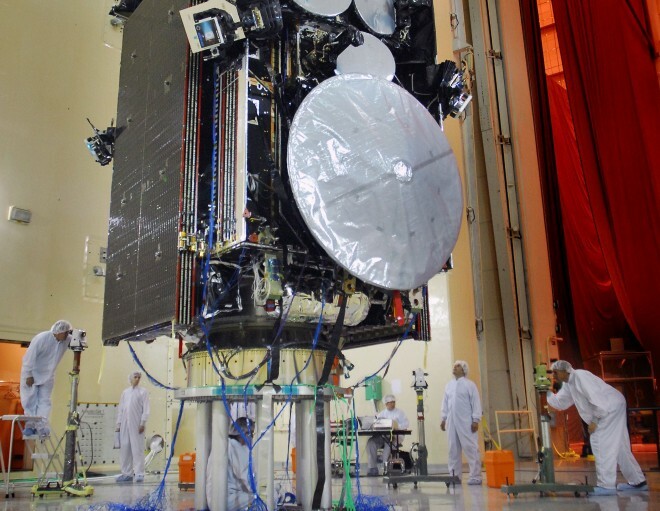 Fourteen months after human error stranded US military Advanced Extremely High Frequency communications satellite (AEHF-1) in the wrong orbit and at risk of exploding, the satellite was finally placed in its correct orbit in October 2011. A successful test completed on February 29 prepared the AEHF-1 for operations, just two months before the second AEHF satellite is scheduled to launch. “This rescue effort was definitely a very sophisticated and highly technical masterpiece,” said Col. Michael Lakos, chief of the Military Satellite Communications Division at Peterson Air Force Base, Colorado. It all started a couple days after AEHF-1’s August 2010 launch aboard an Atlas V rocket. The satellite successfully reached it’s parking orbit. But the main engines needed to circularize the satellite’s orbit refused to work – they kept shutting off. The shut off is a safety feature instituted when a satellite detects a fault in the engines. The question was: what fault? Experts determined that the fuel line must be blocked. But the attempts to engage the engines had resulted in filling the lines with fuel, thereby putting the satellite at risk of explosion and making it hazardous to attempt another engine fire. Luckily, AEHF-1 has two additional propulsion systems, albeit much less powerful, designed for use in stationkeeping adjustments, not major changes in trajectory. However, by applying small propulsive adjustments hundreds of times over fourteen months, ground crews were able to slowly coax the satellite into its proper orbit. The major challenge was keeping it intact in the interim. The satellite had to dodge space debris three or four times and deploy its solar shields much earlier than intended – putting them at risk of degradation from radiation exposure in the van Allen belts. The fault for the blocked fuel line was eventually attributed to a piece of cloth that had been placed over the line during manufacturing to protect it from contamination, but was never removed. “If I had to find the top 10 strange ones, that one would make my list,” said defense analyst Marco Caceres, who tracks rocket and satellite failures as part of his work for the Teal group, an aerospace and defense analysis firm. The Air Force has implemented additional checks for the remaining 5 satellites to be launched as part of the AEHF constellation and docked manufacturer Lockheed Martin $15 million for the mistake. The video below was shown during the Aviation Week’s 55th Annual Laureate Awards March 7, 2012, where the AEHF-1 Recovery Team won the Laureate Award in the Defense category. The awards recognize individuals and teams for their accomplishments and achievements in exploration, innovation, and vision.